The Arcadia Connection is a recurring feature in Network News that keeps you up to date with news about the Arcadia Analytics Dashboard and connects you with information about workflow improvements and best practices that improve measure performance. This issue of Arcadia Connection focuses on the importance of applying the patient list filter and the launch of the new Arcadia Care Management platform. If you have patients who you believe are Inactive appearing in your reports in Arcadia, please ensure that you have applied your patient list. 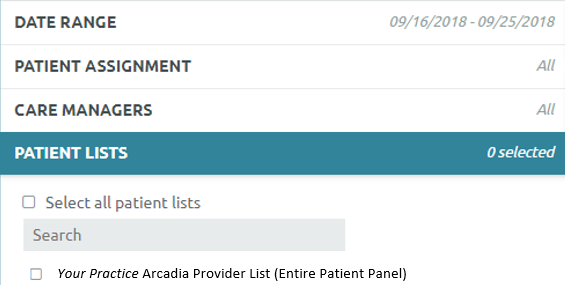 You can do so by navigating to the green global Filters tab on the left hand side of your screen, and under Patient Lists, unchecking “All Patient Lists Selected”, and choosing “Your Practice Arcadia Provider List (Entire Patient Panel)”. If you still have Inactive Patients appearing, it’s possible that the status change hasn’t been sent appropriately to Arcadia. Please confirm the status is up to date in your EMR, and reach out to Elizabeth Sharp with any further questions. We are excited to announce the launch of our Care Management Platform! Our AHP Care Managers will be using an Arcadia-based Care Management platform that will provide a centralized place to house patient registries and perform standardized documentation. We’ve been working with clinical teams all year to develop content for clinical decision support, workflows and best practices for documentation within the platform. We are excited about this new tool and the positive impact it will have on our care managers and the patients they work with. If you have any questions, please reach out to Elizabeth Sharp.